Short version: Pick up the phone and call your Senators and your Rep this morning to demand that they call for Bannon's removal from the National Security Council. Find their info here if you haven't already got them on speed dial. And if you haven't filled out my quick activism contacts sheet yet, do it today. If you don't already know that Steve Bannon has made a huge power grab, I almost don't have the heart to tell you because it's so disturbing that it makes it hard to breathe normally, let alone get work done or sleep at night. Basically, Bannon is seizing control of our government, firing people (via Trump - it's the one thing he's good at...) like former Attorney General Sally Yates who disagree with his executive orders (and make no mistake that they are Bannon's executive orders), deliberately creating chaos with his Muslim ban to leave everyone reeling, destabilize our institutions and provide a smokescreen for even more ill-intentioned maneuverings (I'm not sure what they are yet), and fanning the flames of conflict and hatred to widen cracks and keep warring factions from banding together to stop him. Does this picture make you throw up in your mouth a little? Me, too. Most recently, Bannon got himself a permanent seat on the Principals Committee of our National Security Council (NSC) which is both unprecedented and extremely dangerous. There's also very little staff left in the senior levels of the NSC which is equally disturbing. 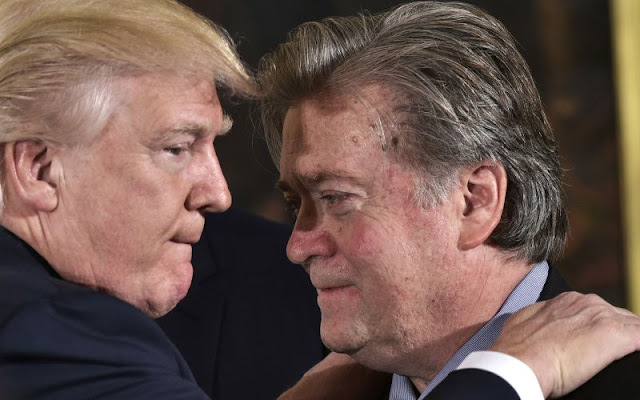 Though it does not really matter as they'd just be superfluous since Bannon has been making decisions and writing executive orders without involving the rest of the NSC (or any other related branches of government) and refusing to put anything down on paper or to let people outside his tiny circle view or share drafts. It is chilling. You can read more about it here and here if you like (but don't blame me if you don't sleep tonight.) Also, the fact that Breitbart wrote an "article" about the second link above is probably an indication that he's right on about his "coup" theory. Michael Moore seems to agree. A 21st Century coup feels right on the money to me, too (though I am definitely a glass half empty kinda girl so...) Meanwhile, what can we do to stop Bannon? 1. Visit your members of Congress to urge them to remove Bannon from the NSC ASAP - bring lots and lots of friends with you. And chocolate. You'll need that. 2. Call your members of Congress with the same request. Find their info here - realistically, you'll have to try all their office numbers at least once to get through since lines are busy and voicemail boxes are always full in the Trumpian era. "Hi, my name is YOURNAME from TOWN/CITY. I don't need a response. I'm calling to urge the SENATOR/REPRESENTATIVE to remove Steven Bannon from the National Security Council immediately. Bannon's presence on the Principal's Committee is unprecedented and inserts a rogue, rabidly partisan, white supremacist influence where it DOES NOT belong. His involvement is putting our national security at risk and is a threat to the lives of our service men and women everywhere. This is not a partisan issue - no President has ever done this before and it needs to be stopped." I'm not honestly sure what else we can do - if you have ideas, leave a comment!